Poetry in motion encapsulates the DMC formula but never so much as in this sixth (yes, sixth) in the series. 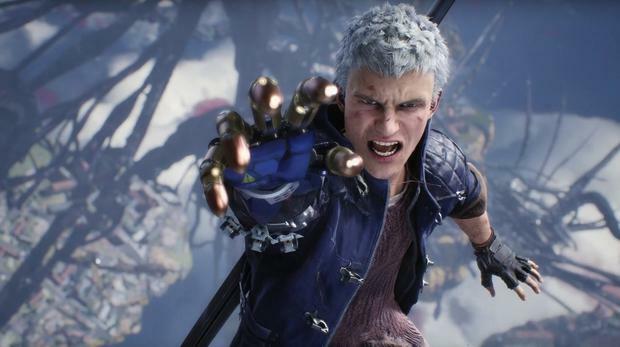 DMC5 returns to the roots of the gothic fantasy brawler after a divisive 2013 reboot. Having had its thunder stolen by the equally outré and balletically violent Bayonetta, DMC strikes back with a marvellously OTT instalment that literally employs poetry as a weapon. Never mind the preposterous plot, the cheesy dialogue and beautiful but static backgrounds of neo-London. What counts is the whirling-dervish foreground action in which one of three charismatic leads scraps with demons using wildly imaginative combat techniques. Series favourite Dante returns with a cavalcade of fighting styles, none more ridiculously fun than a motorbike that splits into two chainsaws. Offsider Nero collects powerful prosthetic arms with varying abilities from electrocution to healing to time-bending. But it's newcomer V who intrigues the most, a relative weakling controlling three demon pets who do the fighting for him. Amusingly, he builds up his power by reading from a tome of poetry during battle. Even though the storyline is comparatively short - not to mention linear - and the inclusion of pay-to-win microtransactions is galling, DMC5 still counts as a triumphant comeback. The gradual unlocking of new skills encourages players to dive back in for another run-through once the credits roll. Every race in this motocross platformer ends with your rider smashing like a ragdoll into a wall or coming a cropper in myriad hilarious ways. It was always thus, the series extracting maximum humour from what is a fairly exacting balancing act as you navigate outlandishly designed dirt tracks full of jumps and traps. Rising amplifies and enhances this juxtaposition of pratfalls and pitfalls with elaborately layered levels, full of motion, explosions and in-jokes. But you're still essentially playing that dance of throttle/brake versus leaning forward/backwards to stay upright. Rising also adds a rather pointless set of cosmetics - to the extent you often spend more time opening lootboxes to earn a silly hat than actually riding a bike. But then it's back to the seductive pull of nailing a perfect run on a crazy course and Trials wins your heart all over again.